Do you want to be the best version of yourself? Join us in this 16 week program where you will be guided to connect deeply with yourself and others, cultivate healthy habits, explore the root cause of addiction, make peace with your past, gain understanding and choice in your behaviour, thrive in the present, acknowledge your strengths, and create an inspired, fulfilling future. If you are unable to attend a Beyond Addiction program where you live, we have designed this online program for you. 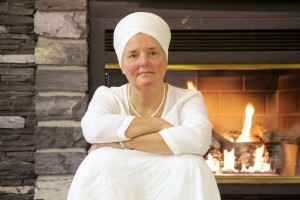 The next group online program facilitated by Sat Dharam Kaur ND begins Tuesday, May 7, 2019 and continues for 16 weeks until Friday Aug 23, 2019. It is also possible for you to proceed through the online program at your own pace, without group facilitation. The online program consists of 16 theme-based modules. The expectation is that you will take 7 days to progress through each module, thus gaining an overview of the program in 16 weeks. If you wish to do the program without weekly group facilitation, you can set your own schedule. You will have access to the online course materials for 8 months after the start date, allowing you to use the materials for two 16 week periods. After this time the cost is $75 for each 4 month period to access the online resources. 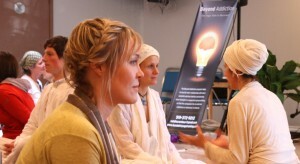 Many people take the program several times – it can become a lifelong journey of self-discovery and self-refinement. We will meet together virtually on Tuesday and Friday mornings, using teleconferencing via Zoom. You’ll need a high speed internet connection and headphones for Zoom. 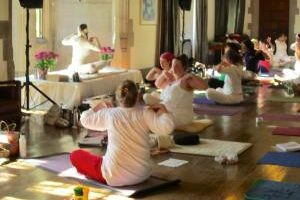 Tuesdays you will be asked to practice Kundalini Yoga with an online video from 6:30-8:00 a.m. EDT (or the previous day), followed by an online webinar from 8:15-9:15 a.m. EDT (Toronto time) with personal interaction. You will need to update Flash on your computer. Lectures are recorded for later listening although discussions are not. We strongly encourage you to attend each session. You will receive a pdf for each of the 16 weeks with the lecture material pertinent to that week’s module, and will be able to interact through “moodle”, an online classroom. 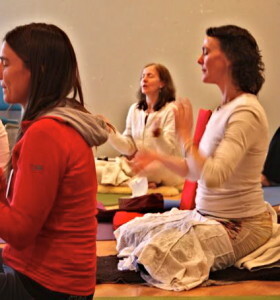 If you would like to use another method to register for this course, we have provided a fillable registration form below that you can fill out on your computer and send to us. Email: Please fill out the completed registration form and use the paypal button or send an etransfer to satdharamkaur@gmail.com. Phone: Please fill out the completed registration form and then call us at (519) 372-9212 with your credit card information. Fax: Please complete the registration form and Fax your credit card information to (519) 372-2755. Mail: Please complete and print the registration form and send it along with your credit card information, cheque, or money order (made out to Sat Dharam Kaur) to: Sat Dharam Kaur, 235 9th St E, Owen Sound, ON, Canada N4K 1N8. Payment may be made by cheque, money order, VISA, MasterCard, or eTransfer. Please call or email Sat Dharam Kaur satdharamkaur@gmail.com if you have further questions or concerns. Cancellation Policy: There are a certain number of spots available for each online program. Once the program has begun, there are no refunds. If you withdraw one week or more before the course begins, a $200 cancellation fee will be charged and the rest of your payment will be refunded.